SIUE’s Music and Theater and Dance departments are collaborating on a musical filled with big ensemble numbers and eye-catching dance sequences that might help some students find what they are looking for : fame. The musical was a hit movie and television series in the ’80s and tells the story of several students in pursuit of fame at the New York High School of Performing Arts. This inner-city high school, although devoted to art, has a strict, competitive atmosphere that requires devotion and commitment from the students. Director Peter Cocuzza believes that the interdepartmental collaboration is what makes the production a unique experience. 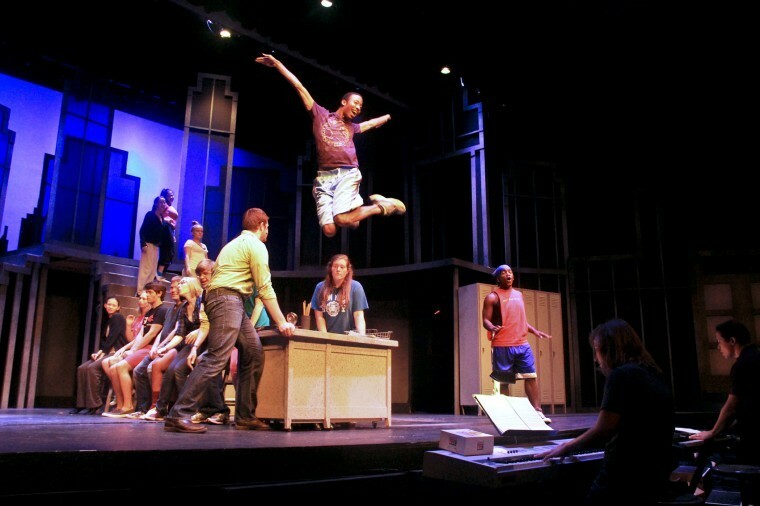 Often to produce a musical script as challenging as “Fame,” universities bring in outside performers and technicians, but this was not the case for SIUE’s production. After considering several plays, the Theater and Dance Department decided to produce “Fame” to kick off the fall season. The production process started with auditions during the first week of the semester, and rehearsals started very soon after. Tuesday’s opening will be the result of a long, collaborative effort requiring a high level of dedication from the performers. “We’ve been working pretty much nonstop from the end of August until Oct. 9, when we open,” Cocuzza said. Sophomore theater major Amanda Wales is excited to work with so many talented performers. Cast members who may have little experience doing all three types of performance will be required to act, sing and dance for this production. Senior theater major Ani Waggoner said performing this piece has helped her learn from other performers. With the curtain about to go up, Cocuzza, along with his cast and crew, is working tirelessly to make sure the show is ready for opening night. Cocuzza is also hoping to see some large audiences during the run and hopes that students will take advantage of the opportunity to see the show. The Theater and Dance Department will present “Fame” at 7:30 p.m. Oct. 9-13 and at 2 p.m. Oct. 14 in the Dunham Hall Theater.